We moved to Flaxley in 1973. The front room of our house was the Flaxley Post Office and Mum was the Post Mistress. 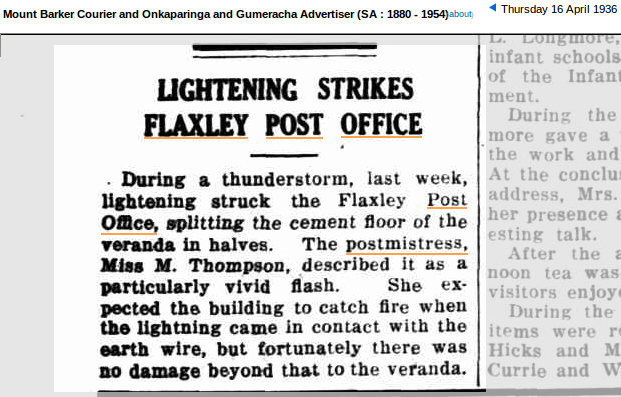 I had a look on Trove to see when the earliest mention of the Post Office was. These two occurrences are quite familiar to me. 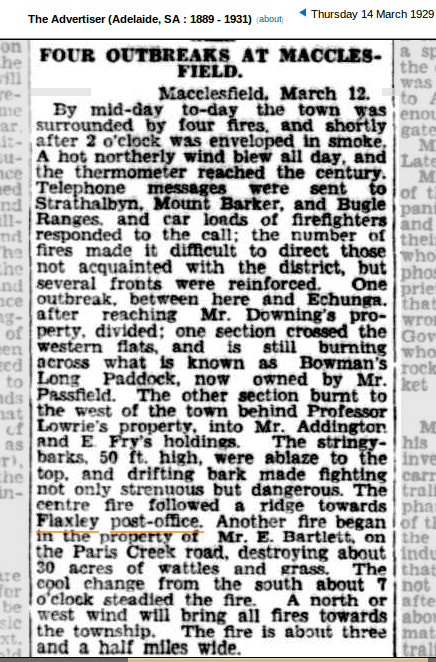 I remember in the late 70s when lightning struck the stobie pole (power and telephone pole) out the front of the house and the live power line hung precariously over the road. My brother, sister and I were enlisted, with torches, to flag down passing traffic so that no one hit it. That wasn’t a lightening strike Kylie. The instulator that the line is connected to broke and the line was hanging from the pole towards Megsons (with a junction box on it) to the pole on the Macclesfield Rd. The line pulled at the junction box and shorted to earth, that was the flash and noise. Amazing that lightning could split a cement floor, but I guess it is a very powerful natural force. I remember the crack in the veranda – wondering if it’s the same one that was never repaired!